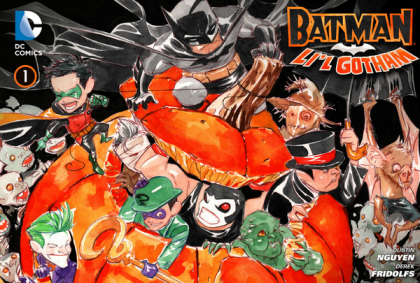 SETH’S PICK :: BATMAN LI’L GOTHAM #1 :: On paper, it looks like a standout week for new books. There are sure things like Hawkeye #9, Saga #12, a new Marvel Oz hardcover, and books you should be reading if you aren’t already, like Sledgehammer 44 #2 and Rocketeer: Hollywood Horror #3. I’ll pick all of these up, but have chosen as my official staff pick, this delightful new series from Dustin Nguyen. At first glance it might look like DC is trying to jump on the ‘baby variant’ bandwagon, but for those who don’t know, Nguyen started producing these stories as digital only releases last year. Having read many of the stories online, I’m excited to see them enter our glorious realm of print. These are fun all ages comics that feature diminutive versions of Batman and his extended family of heroes and foes on holiday themed adventures. They’re perfect for young readers or any adult fans who appreciate lighthearted palate cleansers. Bonus Pick of the Week: Most of you know that the majority of the Heroes staff is comprised of creative people. Several of us are in various stages of developing our comic work. Rico, of course, colors world class comics all the time, and others like Bridgit are quickly developing into creators on the rise. Add to that list our own Justin Crouse, who contributed art to three stories in a new book on the shelves this week. Pick up Center of Gravity from Low Key Comics and see what Justin works on outside of Heroes. I’m particularly fond of the first story “Monkey Bars.” There are some nice, quiet moments in it that remind you of Justin’s skill as a visual storyteller.